Material Setting: Using the Moisture Meter for Wood, Drywall, Carpet, etc. 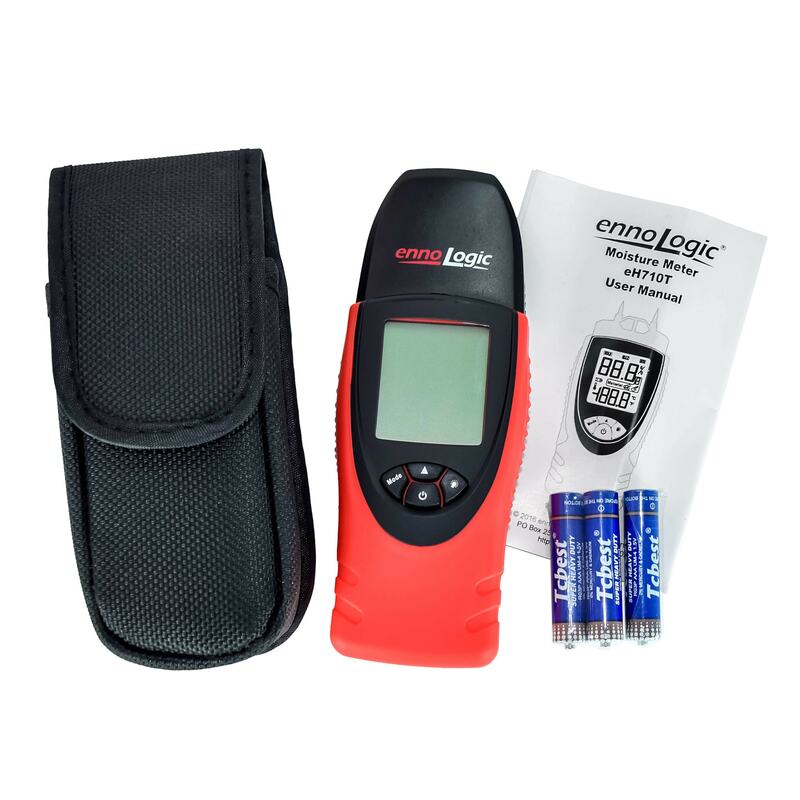 The ennoLogic Moisture Meter eH710T allows you to measure many different types of materials for moisture content, including wood, drywall, carpet, concrete, and many more. The meter’s material setting has 7 different materials to choose from. The moisture meter operates by measuring the electrical impedance of the material between the two pins. It then correlates that with moisture content. So, make sure both pins make good contact with the material you’re measuring. You don’t need to apply excessive force though. You just want to make good contact. Remember, your fingers conduct electricity too, usually better than whatever material you’re measuring. So, don’t touch the pins while taking a reading! To get started, open the battery compartment on the back of the unit, and insert the 3 AAA batteries included with the meter. Make sure to put them in with the correct polarity, and don’t forget to put the cover back on. Let’s begin by getting familiar with the different settings and their corresponding list of materials. As you can see from the table, each setting has a specific moisture range. Each material setting uses its own formula to calculate moisture content from the measured impedance. This makes the meter very versatile compared to meters that can only measure one type of material. But this also means it is very important to select the correct material setting. If the composition of the material is unknown, use setting 1 which has the widest moisture content range and is most appropriate for the widest range of materials. To take a reading, first determine the material setting which best suits your requirements and select that material setting. One meter for all your moisture reading needs. To dial in your material setting press the arrow button multiple times. You will see the material number cycle through a range of 1-7. Along with the number of the material setting, you’ll also see one of the two following symbols: “wood” or “building material”. Note that the material setting for carpet is setting 1, which will display as the symbol for wood. When you first turn the meter on and apply the pins to a material surface to take a reading, the display will often flash a ‘Lo’ or ‘Hi’ reading on the screen before it settles into the actual reading. Hold the pins in place for 3 to 5 seconds and wait for the reading to stabilize before moving the pins to the next location to take another reading. If it remains on “Hi” or “Lo”, that means the moisture content of the material is outside the range the meter can measure for that type material. A ”Lo” reading means your material is drier than this range, and a “Hi” reading means the material is too moist to be measured. To get the most accurate results, be sure to take multiple readings at different locations across the surface. When measuring wood, push the pins gently into the wood. For carpet and/or carpet underlayment measurement, press the pins into the material backing of the carpet or the foam of the underlayment. When measuring drywall, brick, cement or other dense materials, the pins do not need to penetrate the material, but they do need to be in direct contact with the material surface to allow for good electrical contact. One exception to this is if you suspect moisture behind drywall that has not penetrated the painted surface of the drywall. In this case, the pins must penetrate the painted paper surface of the drywall to measure the interior of the drywall for accurate readings. But most often, drywall that is wet is saturated through the painted paper layer. Press the power button to turn the meter on. You can also turn the backlight on if you need it. Next, select the right setting for the material you’ll be measuring. Press the pins into the material. Make sure both pins make reliable contact, but don’t use excessive force. Wait two or three seconds for the reading to stabilize. Read the moisture value, and you’re done! It’s that easy. To finish, briefly press and release the power button to turn the meter off. But don’t worry if you forget, it shuts itself off after 10 minutes without use. Properly seasoned firewood should be in the range of 15% to 20% moisture. Be sure to select the right setting for the type of firewood you’re measuring. Higher moisture content may mean the wood has not been properly seasoned. This wood may not burn well, may be difficult to start, and makes reducing the air flow difficult without putting it out. Conversely, wood that is very dry produces a fire that is hard to control, with a lot of smoke. Expect a non-water damaged drywall to produce a “Lo” reading. Keep in mind that the moisture content of your drywall will equilibrate with the moisture content of your environment. That means, if you live in Arizona, your drywall will have a much smaller moisture content than drywall in Florida or Louisiana. Like drywall, a properly dry carpet will give you a “Lo” reading. Take note that the area directly in contact with the pins specifically limits the meter’s reading. So don’t be surprised to identify small confined areas of moisture from pet urine etc. with dry areas right next to them. This can be a great advantage for identifying precisely where cleanup needs to happen. Below the moisture reading, you will also see an air temperature reading. For many applications, it is important to know what the current temperature is when taking the moisture reading. To change the units, press and hold the power button for 3 or more seconds to enter the preset / temperature configuration mode. Press the arrow button to choose Celsius or Fahrenheit, then press the Mode button to confirm. Press the Mode button again to return to normal operating mode. For hard to reach areas, you can use the “Mode” button’s Hold feature to freeze the value and then review it after taking the reading. Simply push the pins into the material, wait about 3 seconds for the reading to stabilize, and press the Mode button once. This will freeze the value and temporarily store the reading. You can then remove the meter from the material and read the displayed moisture. When measuring larger areas, such as a section of drywall, you can take several readings and then use the Mode button to review the highest and lowest value of all readings taken since you turned the meter on. Pressing the MODE button repeatedly cycles through Hold, Max and Min modes, and then back to normal operating mode where there are no MODE symbols displayed.